HAPPY VALENTINE’S DAY! I just want to take a second on this day of love and all things pink to THANK ALL OF YOU for visiting my blog and letting me be a small part of your day! I love reading your comments, your tweets, your messages, your emails and personally connecting with you each and everyday, I’m so thankful to do what I love as my job. And I couldn’t make it happen without all of you! STEP 6: Fill each cupcake liner about 3/4 the way full with cupcake batter. Bake 18 to 20 minutes or until toothpick inserted in center comes out clean. Allow cupcakes to cool before frosting. STEP 8: Slowly, add powdered sugar and heavy whipping cream. Mix until frosting becomes light and fluffy, adding milk until the mixture reaches desired consistency. Add caramel sauce and mix until combined. STEP 9: Frost cooled cupcakes using a piping bag or knife. Top with SPRINKLES & a Twix bar. 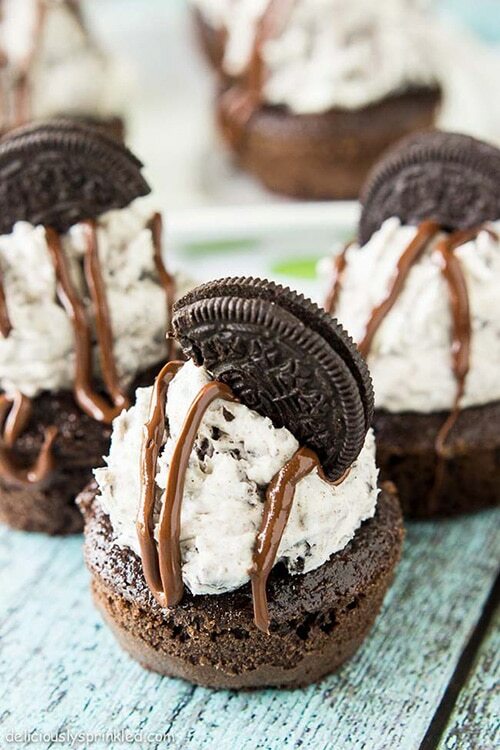 And make these Chocolate Oreo Cupcakes next! I noticed that corn syrup was listed on Step 7 for the buttercream, but it was not listed in the ingredients. How much is needed (if any)? Thanks! Thanks for catching my mistake! You will need 2 Tablespoons light corn syrup! I love Twix too. When you combine it with a chocolate cupcake and caramel buttercream frosting it sounds awesome! Absolutely yummy-licious! 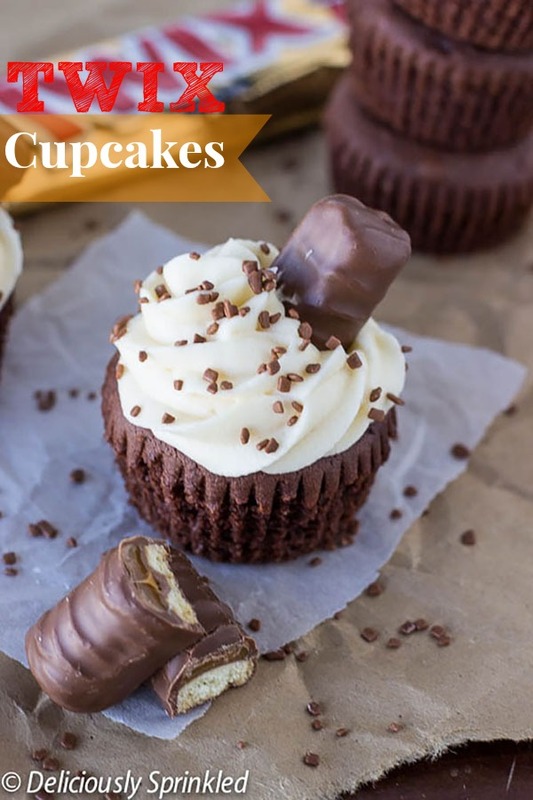 These cupcakes look super moist… and with this Twix action going on– so in love! Thanks, Gloria!! 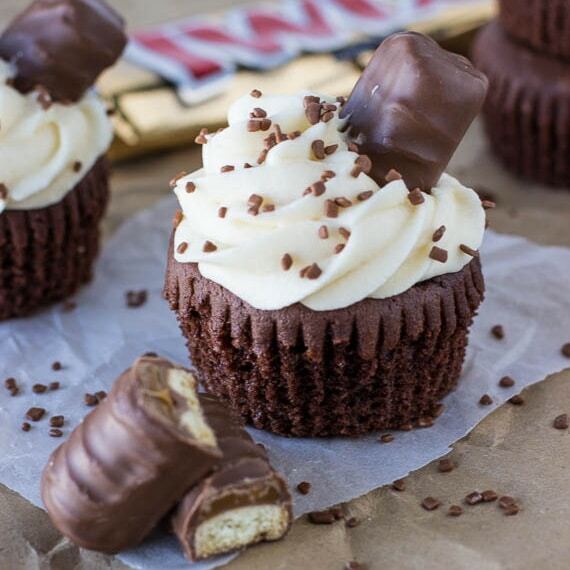 Chocolate cupcakes and Twix make the perfect love match, so delicious!